Mgahinga Gorilla National Park as a Uganda gorilla safari destination covers 8% of the Virunga conservation area with an area of 33.7 km2. 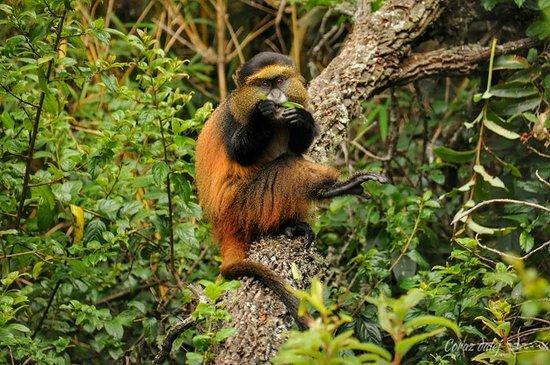 Mgahinga National Park protects the rare primates; mountain gorillas that inhabit its dense forest. Mgahinga National Park and Bwindi Impenetrable National Park are the only parks in Uganda that protect mountain gorillas hence hosting a very good number of visitors for Uganda gorilla trekking safaris. However, travelers on safaris in Uganda. Mgahinga National Park is situated southwest of Kampala Uganda’s capital city. From Kampala, where our safaris normally start from, Mgahinga Gorilla National Park Uganda is about 510km while using the Kampala – Masaka – Mbarara – Kabale – Kisoro road. It takes a drive of about 8 hours to get to Kabale and around 2 – 3 hours to Kisoro. On arrival to the park, the Uganda gorilla safari activity begins with a briefing from the rangers or guides. Besides the gorilla trekking safaris Uganda, Mgahinga is also home to Uganda golden monkey trekking safaris. If you using the Kisoro road, Mgahinga National Park is just 15km south of Kisoro town and 55km west of Kabale if you are in Kabale. Strong 4WD cars are advised to be used while in this region. Uganda flying safaris using scheduled flights can be arranged from Entebbe International Airport. Flights to Kisoro airfield are arranged by service operators like Aerolink Uganda, between Monday and Friday. The flight to Kisoro takes around 1-2 hours. On arrival to Kisoro, the tourist is then driven to Mgahinga National Park along the Kisoro-Cyanika road which is about 17km taking about 45minutes. The best time for touring this Mgahinga National park can be all year round however the stirring time is during the dry seasons. The dry seasons are in the months of December – February and May – August. However, months having low rains are also good for a Uganda safari like June and July so they are also good to visit. The wet seasons are in the months of February- May and September – December. But the wettest months are March-April and September-November. These are not good for safaris because the roads can be difficult to use since they are slippery. During the day, the temperature is around 15 degrees and 10 degrees at nights.